Putting the right stuff in the right bin is really important. When the wrong items are put in with recycling it is called contamination. Nationally around half of us regularly include items for collection which cannot be recycled, and when contaminated loads of recycling are found, it can potentially result in the whole lorry full being sent to landfill. Around 25% of waste in the rubbish bins in Eastbourne could have been recycled; and the recycling we collect is often contaminated. 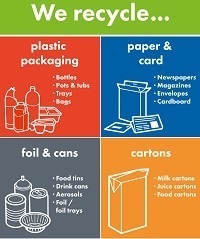 Knowing what you can and can’t recycle really helps to reduce contamination and also increase our recycling rate. The most common items contaminating our recycling are black plastic bags and sacks; food waste; and nappies. If you're unsure whether you can recycle an item, it's better to keep it out and put it in your waste bin! We collect a wide assortment of items including plastic tubs, trays and bottles; paper and card; glass and tins. You can find a full list on the household waste recycling service page of our website. Glass cookware and ovenware, drinking glasses or ceramics – although it may sound unusual, these items cannot be collected for recycling from your home. Cutlery, crockery, pots and pans cannot be recycled at home but can be taken to your local household waste recycling site. Nappies cannot be recycled. Many people think they can be recycled as they are made from paper pulp but they can’t. You can take any extra recycling such as electricals; energy saving lightbulbs; metal items; textiles; and batteries to the Household Waste Recycling Site at St Philip’s Avenue. If in doubt, check before you chuck by using the ‘what goes in my bin?’ section of our website. 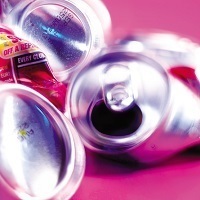 If every household in Eastbourne recycled one more drinks can per week, it would save enough energy to power a typical primary school for just over 10 WEEKS! Bourne to Recycle bumper £250 Christmas draw! Our recycling rewards scheme, Bourne to Recycle, offers all Eastbourne residents the chance to win cash prizes in a monthly draw. This Christmas we’re offering a top prize of £250! Have you signed up yet? 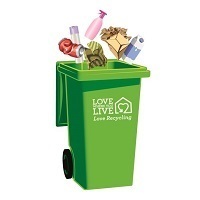 As a thank you for your recycling efforts and helping to increase our recycling rate, all registered homes are entered into a monthly prize draw, with cash prizes of £100 each for five lucky winners. This Christmas we’re offering a bumper prize of £250 on top of five £100 prizes. You have to be in it to win it and all you have to do is sign-up – what are you waiting for? Registering is easy and takes just a few minutes. Simply visit www.lewes-eastbourne.gov.uk/bournetorecycle.